One summer when you served as pastor at Salem (Sycamore) we did a study of different movies. One of the movies we looked at was "Places in the Heart" with Sally Field. I recall a communion scene at the end of the movie where everyone was present, no matter their race, religious views, or social class. Even persons who had died in the movie were present in this scene. The very next Sunday, I imagined sitting with my grandmother (who is deceased) and receiving communion with her. On the Sunday I returned to church after my dad died this spring, I again imagined receiving communion with him. This Holy Sacrament we share has been shared with hundreds of thousands of people throughout the ages and will continue after we pass from this earth. I believe the Sacrament should be shared with all, believers and non-believers. Who knows, that piece of bread and drink of wine may be what brings someone to Christ. Thank you, Pastor for sharing with us each week. “Feed me till I want no more” Jesus knew before hand just how hungry we were going to get for the living Word. Our times in worship, our spending time feasting, as the disciples did at the last supper has turned out (thank God for Pentecost) to be a universal “dinner time.” If we were not feasting on Jesus’ bread out lives would be empty and our hearts would clogged with the arteries damage. “Do this in remembrance of me” All the ritual that accompanies our suppertime together is because of Jesus walking down that road, carrying the heavy burdens, reaching the cross for our sins. But, wait! All was not lost the energy to move towards the Cross was because the last supper gave Him the strength to do what He was called to do. 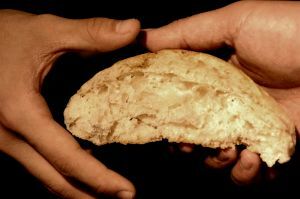 Today, I thank God for the bread of life! I was the last to serve communion to my mother-in-law just 3 months prior to her death. Failing health had kept her from attending church services and, unfortuantely, her church sadly neglected keeping in touch with her, let alone administering the Eucharist. I smile as I remember using grape juice instead of wine, primarily because of her staunch Southern Baptist views regarding alcohol. But she lovingly appreciated the Lord's Supper inspite of my using the Lutheran liturgy totally from memory. Similarly, I was the last to give my own mother Holy Communion two years ago. While Mom is still with us, the ravages of Alzheimer's dementia has affected her ability to both swallow and to comprehend any communication; in fact, she no longer knows who I am nor does she recognize my brothers or my sister. Nonetheless, she did actively participate in the Eucharist at the time I served it to her. While our Lord tells us to feed all those who hunger, perhaps we should look closely at members of our own family who might also be among those who hunger for the bread of life. For whatever reason, they, too, may be among those who hunger and may be easily overlooked in our concentrated efforts of seeking others lacking spiritual nourishment. Kris, I totally agree...it is always a gift to see the wonder on the faces of children when they first receive communion. I'm with you... when DID we lose that?